The Computational and Intelligent Systems Engineering Laboratory aims at promoting the modern Data Science among young students at University of Sannio, by investigating and experimenting the application of advanced techniques of artificial intelligence, data analysis and decision making to problems of industrial and practical interest, with a specific focus on Big Data processing and Machine Learning. Becoming a data scientist means to master different methods and technologies, coming from different fields: Programming, Databases, Math and Statistics. In addition, a data scientist is asked to keep curiosity about data and their application domain, creative thinking and passion for cutting-edge technology, soft skills in order communicate ideas and analysis outcomes. 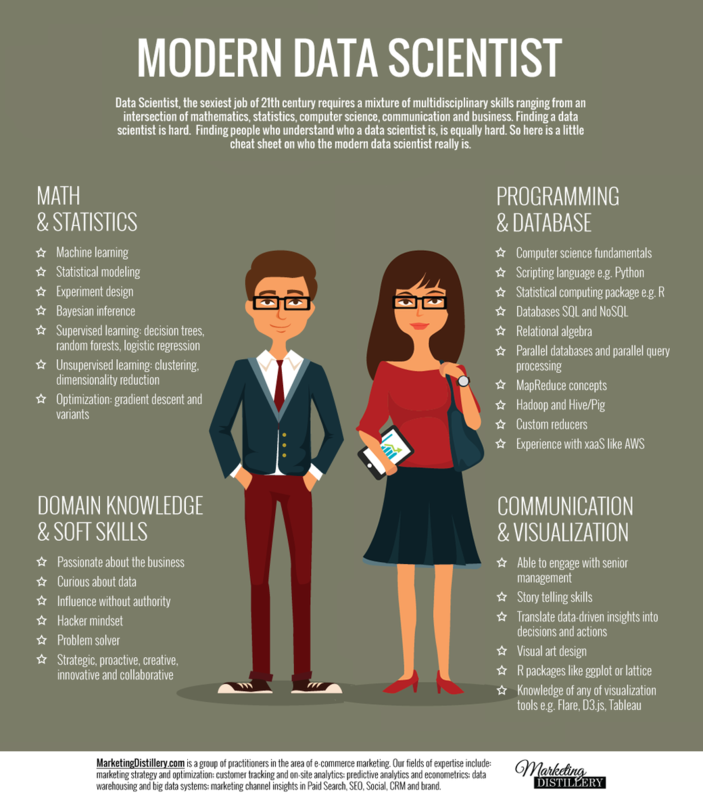 Infographics below offers a good overview of modern data scientist skills and expertise (courtesy of Marketing Distillery). Taking part to CISELab is quite easy. We only require that students are motivated and keen to learn advanced technologies and methods of the modern Data Science. We outline a path that will help students to approach the laboratory. 3. You already followed the course "Elementi di Intelligenza Artificiale"
If you are meeting this checklist, please do not hesitate to contact us. You will find the form to get in touch with us is here.